Experience a 2 day diving adventure at Phi Phi. This is an excellent tour designed to maximize your diving time at Phi Phi. This is ideal for people who have dived before and also beginners. 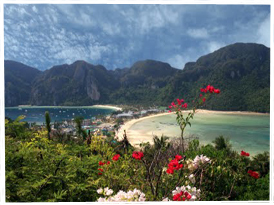 You will spend 2 days diving in and around the Phi Phi area and will spend the night in an amazing beach front Resort. If you do not want to dive you can try snorkeling. In between your underwater experience, you will visit the most beautiful beaches: Bamboo Island, Monkey Beach, Viking Cave and Maya Beach. The tour package includes a transfer service by minibus (a transfer charge may apply to pick ups from the Northern Phuket area), all meals which are served buffet style at the Resort, cold drinks and fresh fruit on the boat, twin shared bungalows, English speaking tour guide, diving instructor, dive master, insurance and snorkeling equipment. There will be a maximum of 12 divers or 16 non-divers on the speed boat. When Does This Tour Operate? You will be staying overnight at the Vikings Natures Resort, situated in the heart of Phi Phi Don. The resort is the ultimate private paradise. The bungalows, restaurant and facilities are all designed in keeping with the beautiful nature which makes up the location. There is also access to 2 private beaches, one is lined with large boulders along the shoreline. The other beach is a stretch of pristine white sands.